A world-first patented electronic capsule developed in Melbourne to help identify gut disorders – which affect one in five of us – has taken out the top spot in a prestigious international competition. The already booming Victorian medtech, biotech and pharmaceuticals sector has been given another lift in the form of a major award to a Melbourne start-up. Atmo Biosciences, using technology from RMIT University, has developed an electronic capsule which, when swallowed, is able to measure gut biomarkers in real time. 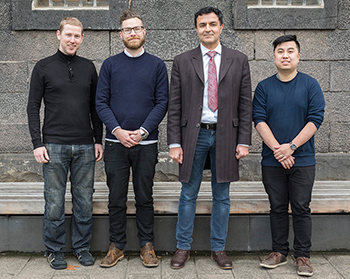 The start-up team of four scientists beat entrants from around the globe to land first place in the Johnson & Johnson Victorian QuickFire Challenge. Atmo Biosciences’ breakthrough capsule, which is about the size of a vitamin pill, is swallowed and as it moves through the gastrointestinal tract, detects gases which are important biomarkers of disease, dysfunction and dysbiosis (microbial imbalance). Real time, the capsule transmits the results to a handheld device for doctors to examine. Scheduled to hit the market by 2021, the capsule will retail for less than $200 per unit and promises a rapid, non-invasive diagnosis. Capsule co-creator, Dr Kyle Berean, says this ease-of-use is what drew the attention of the QuickFire competition’s judges. "We caught the judges’ eyes because we’re reimagining how you test for disease," Kyle says. 'We make groundbreaking discoveries with almost every person who swallows the capsule. And while current diagnostic methods for gastrointestinal disorders are often invasive [think biopsy] or rely on subjective symptomatology [like breath testing] and questionnaires, this capsule aims to be the 'diagnostics gold standard' for patients presenting with common gastrointestinal symptoms, resulting in targeted treatment, earlier relief of symptoms and reduced healthcare costs." What’s even more revolutionary is that the capsule could also be used to expose potential links between stomach and brain health. "There are exciting discoveries happening all the time relating to gut bacteria and mental health: the gut-brain axis," says Kyle. "We’re starting to realise the impact gut microbiome can have on regulating other processes in the body – our device will hopefully allow for insights that will further the discovery in this relatively new field" Kyle said. There's no question Atmo’s capsule is destined to revolutionise patient treatment for a large portion of the population. One in five of us, after all, will suffer from a gut disorder in our lifetime and up to 30 per cent of us will remain undiagnosed. Having such radical discoveries occurring in our own city is testament to Melbourne’s strength as a medtech cluster, concludes Kyle. "Medical institutions and clinicians here are often opinion leaders in their fields. Plus, there’s research and development tax incentives; access to big pharma; investors; potential channel partners and the Victorian Government actively fostering this area. It creates a strong community that draws big innovators." 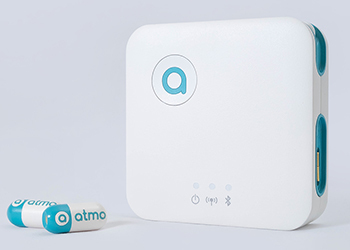 Update: In an update to this story, Atmo reached a commercial licence agreement with RMIT in October. This could see the capsule hit the market as soon as 2022 and allow phase 2 clinical trials to be pursued soon. Be sure to follow @DEDJTR on twitter for updates and other stories. Atmo’s win was just one in a series of what are known as QuickFire Challenges. These competitions are held globally and are coordinated by international medical device and pharmaceutical experts, Johnson and Johnson Innovation. The challenges broadly highlight medical solutions – but this challenge ‘Driving Device Innovation’ was a unique collaboration with the Victorian Government. The overall competition encourages global innovators to submit game-changing, early-stage medical device technologies, with the potential to make a major difference for people experiencing the most pressing healthcare concerns. This device-focused Victorian QuickFire Challenge, won by Atmo Biosciences, was a way for major player Johnson and Johnson to build a relationship with Victorian innovators. Now recognised as one of the world’s ‘life sciences clusters’ (an assembly of medtech, biotech and pharma), the $12.7 billion sector in Victoria employs more than 23,000 and brings in $1.3 billion in exports. Three winners will share in up to $300,000 of grant money and receive access to Johnson & Johnson Innovation's prestigious global mentoring and development resources. RMIT played a key role in the designs by two of the three award winning teams. The Victorian Connection also spoke to the other local winner, an RMIT research team which developed a skin patch to electronically monitor UV exposure. Read that story on the Victorian Connection website.